Texture paste is great for adding dimension to the surface of Smoothfoam. The textures on this little angel’s hair and dress really bring her to life! 1. Trim a small slice off both ends of the egg (angel body). Trim a small slice off one end of the ball (angel head). 2. Glue the flat side of the ball to the narrow end of the egg. If the assembly doesn’t stand on its own, sand or trim the wide end of the egg so that it’s flat and even. 3. Use a palette knife and/or paintbrush to add texture paste to the head to create curls and spikes of hair. Add more texture paste to the body and fashion larger lumps of paste into arms and hands. 4. After the texture paste is dry, paint the angel in desired colors. Use white to highlight the textured areas. 5. Fray the edges of the muslin strip (wings). Bring the ends into the center and overlap. Scrunch the overlapped area while wrapping with a short length of craft wire. Glue the wings to the back of the angel at the base of the head. 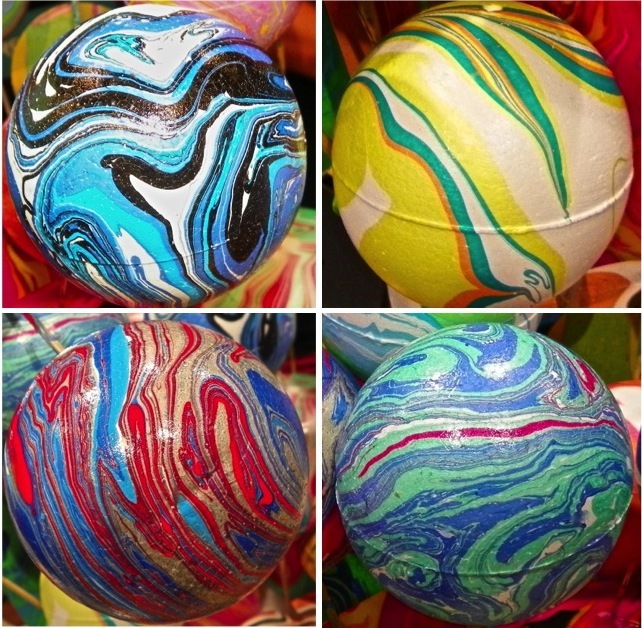 This week we visited the Craft & Hobby show in Las Vegas and spent some time in the Magic Marble booth where they were demonstrating how to marbleize a Smoothfoam ball with their patent-pending swirling paints. The process was fast and easy and the result is breathtaking! The paints work in regular untreated tap water – just add a few drops of the colors you like and gently swirl them around a bit. The colors stay on top of the water and transfer right to the object. Dip it in slowly and hold it underwater for a couple moments while you swipe away the excess paint to clear the surface. Then pull it out of the water and voila! Smoothfoam has a great smooth surface for painting…don’t these “marbles” look amazing? They’d look so cool sitting in a bowl on the coffee table or hanging as a mobile. 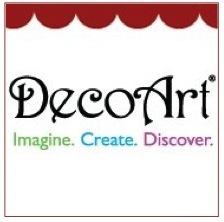 Check out the quick video I took of their demonstration with a 3-1/4″ diameter ball – now I just want to marbleize everything! Carving letters out of Smoothfoam is really fun – and a hot-wire craft tool makes it easy. In the middle of summer, one way to keep cool is to think cool thoughts. For me, that means snow! I have to admit that I actually felt a little cooler after carving this wall hanging and decorating it in wintery colors. I love Christmas in July…I think there’s a little nip in the air here! 1. 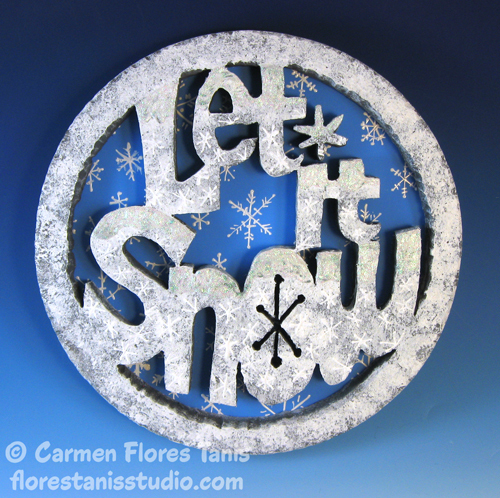 Draw the words “Let It Snow” on paper (or print from the computer) to fit within the 12″ disc diameter, allow at least a 3/4″ border. Tape the drawing to the Smoothfoam disc and insert carbon paper between. Trace around the words with a pencil to transfer them to the disc, then remove both papers. 2. Carefully carve out the letters with the hot-wire tool. 3. Cut a 12” circle from the foam core sheet. 4. Paint the letters gray, let dry. Stipple a little white paint on top of the gray with a stencil brush for a mottled effect, let dry. 5. Paint the foam core circle blue. When the blue is dry, draw little snowflakes all over it with white Scribbles paint. Set aside to dry. 6. Glue the carved Smoothfoam to the blue circle. Embellish the letters as desired with Scribbles Crystal Gel and add more tiny snowflakes with Scribbles® white paint. 7. Glue a picture frame hook to the back of the circle for hanging. 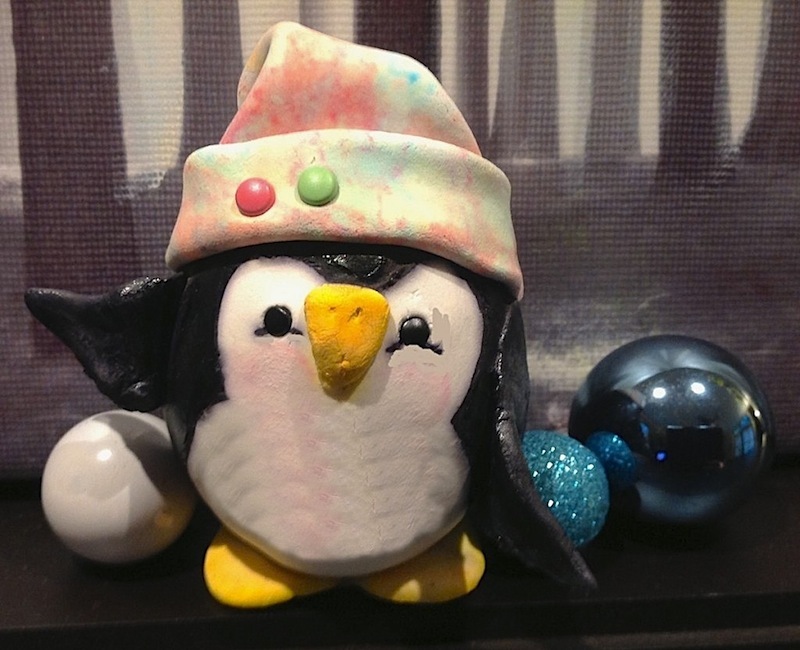 Smoothfoam works well as “armature” to wrap with air-dry clay, like with this cute penguin ornament. Outside it might be sizzling hot, so I suggest you stay in and stay cool creating sweet penguin peeps! Penguins are so lovable and irresistible with their black and white feathery tuxedo fronts and the way they waddle. 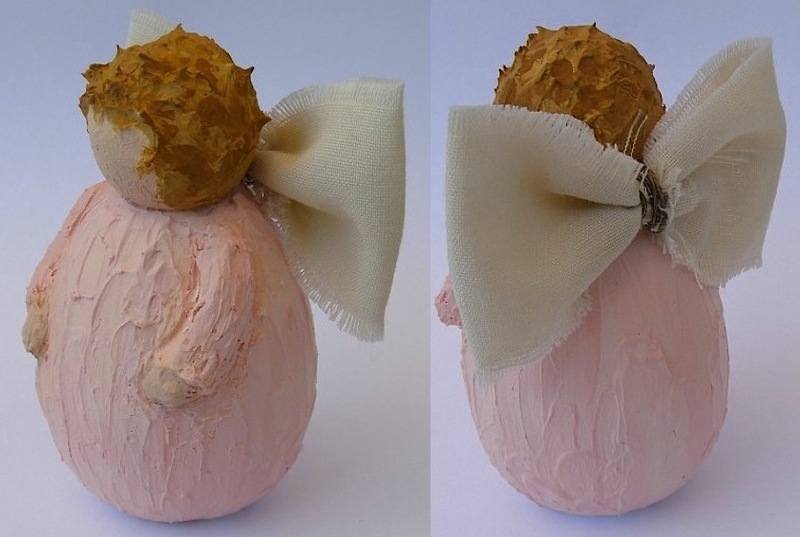 This perky little pal is quick and easy to make using a Smoothfoam egg and air-dry clay. Activa Hearty Clay – 1 pkg. 1. Break off a third of the clay and cut in half. Roll out one half for the penguin body. TIP: Wrap pieces of open clay in a baby wipe or damp paper towel and place in a ziplock bag to prevent drying out until you’re ready to work with it. 2. Wrap the flat piece of clay around the Smoothfoam egg, smooth out evenly and remove excess. Dip your finger in water to smooth the seams. 3. Draw a light pencil outline of the penguin’s face and chest area as shown, then paint the rest of the penguin black, allow paint to dry. 4. Roll out the other half of the clay and cut out two hearts with the cookie cutter. Cut one heart in half for the wings and stretch out each half slightly. Use the other heart for the feet. Cut a small ½” triangle from the scraps for the beak. 5. Paint the wings black, then paint the feet and beak yellow, allow paint to dry. 6. Attach the wings, feet and beak by dipping your finger in water to smooth each piece against the body. Angle one wing to the side so it looks like he’s waving hello! 7. Insert two brads for the eyes (use a straight pin to make a starter hole). Draw the eye lines with a black marker. 8. Break off another third of the clay and roll out. Cut out a 4” tall triangle with a 5″ wide base (for the hat). 9. Draw a plaid or criss-cross stripe design on the triangle with the pink and green markers. Fold the triangle against itself several times and roll it out again to blend the colors a bit. Shape it back into a triangle and wrap around the top of the penguin like a hat. Fold over the bottom edge to make a hatband. Embellish the hatband with colored brads. 10. Lightly rub a bit of pink paint on the penguin’s cheeks with your damp finger. Use a toothpick to lightly indent some feathery-looking arches into the chest as shown. 11. If you want to hang as an ornament, use a toothpick coated with a little glue to poke a loop of ribbon down into the top of the Smoothfoam ball, just behind the hat. Allow the clay to dry overnight. I love the smooth, semi-transparent look of encaustic painting. 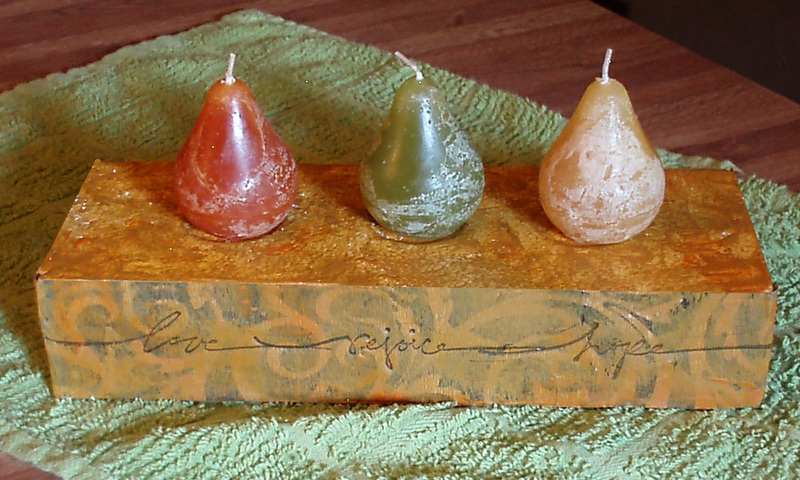 Wax seemed like the perfect medium to decorate a base for this trio of small rustic pear candles! I love candles…their warmth, the beautiful colors and the wonderful scents. However many of my friends and family have allergies, and scented candles can be some of the worst offenders. To keep everyone happy and healthy, I indulge in my candle fetish by looking for unscented candles in unusual shapes and colors, like these three little pears. These candles live in my kitchen window and they almost appear translucent when the afternoon sun shines on them. But at only 3″ tall, they were too small to make a decorative statement. 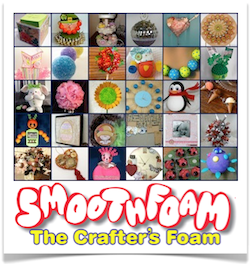 So here’s a Smoothfoam block to the rescue! 1. 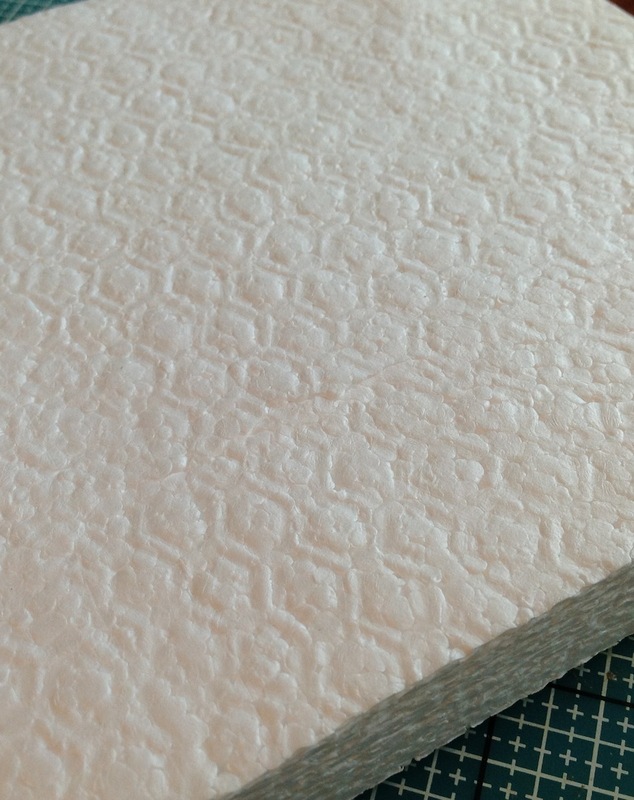 Cut the Smoothfoam block down to 10″ long. 2. Glue a strip of crepe paper around the edge of the block and other on top of the block, allow to dry. This gives the wax something to adhere to and the pattern will show through lightly. 3. Apply a thin coat of melted wax with the craft iron (low heat) over the top and around the edges. Try blending and swirling colors – I used the green and yellow wax together on the edges, and then used the orange with yellow on top. 4. When the wax is dry, stamp your word or image along the front edge with black ink and let dry. 5. Press the bottom of the jar firmly into the Smoothfoam in 3 equidistant spots to make shallow indentations, then place your candles in those spots. I had so much fun painting and shading my gingerbread man to make him look like a real cookie…and in just a few short months he’ll be serving up lots of treats! 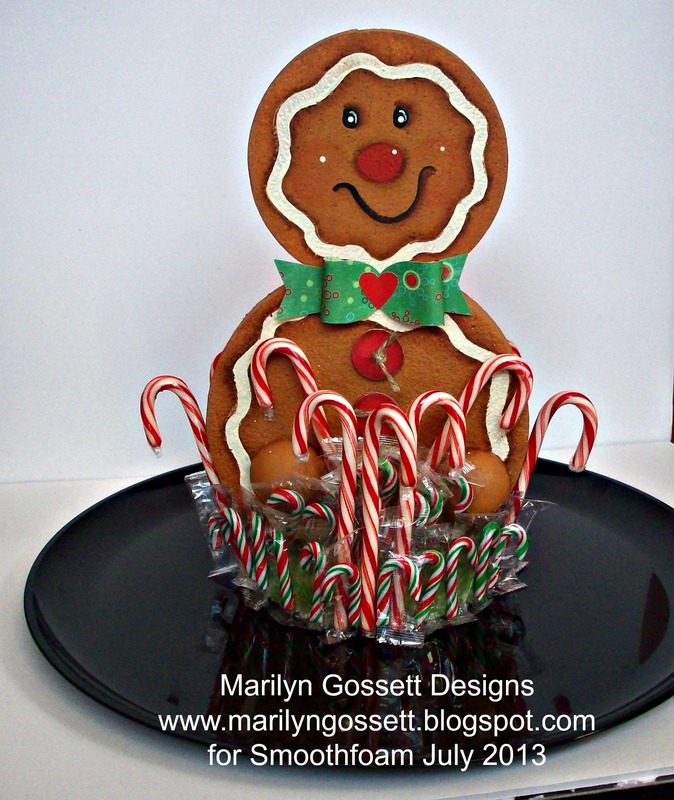 Thankful for the warm summer day, I enjoyed creating this gingerbread man centerpiece – it will be perfect on a large tray of Christmas cookies. It’s Christmas in July here on the Smoothfoam blog…we’re giving you a little peek into the holiday that will be upon us before we know it! 1. Cut away a little curved area from the edge of the 8″ disc (body) to nest against the 6″ disc (head). Cut the 2″ ball in half for hands. 2. Poke a toothpick into one side of each disc to use as a handle. Poke the other end of pick into the scrap foam when you’re ready to let paint dry between steps. 3. Paint one 6″ disc green for the base of the centerpiece and paint the other two discs and ball halves light brown. 4. Using the right brush makes all the difference when you paint his face and details as shown. For the frosting trim in ivory, use the 1/4″ brush. 5. Paint his eyes & mouth black with the liner brush. Paint his nose reddish brown with the 1/4″ brush, and use the liner brush again to highlight dots in ivory. 6. 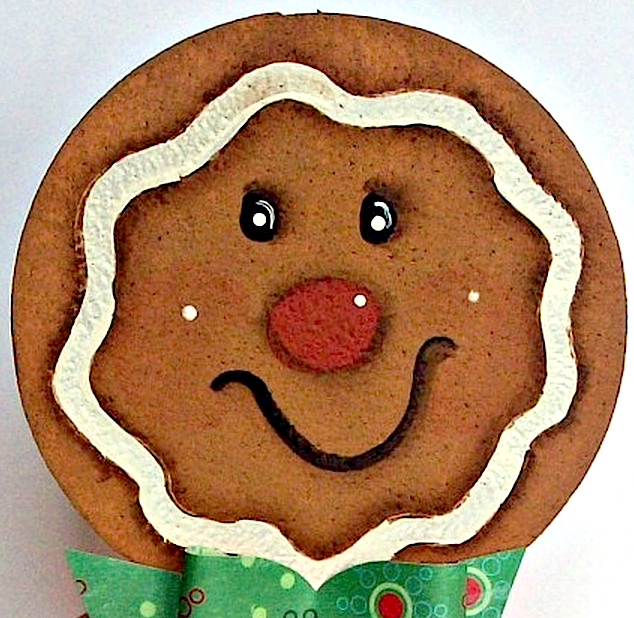 Shade around his eyes, nose and mouth, as well as around the frosting trim with dark brown, using the angled brush. Shade the edges of his hands, too. 7. Die-cut the bow tie (1-1/2″ x 4-1/2″) and buttons (1-1/4″) from cardstock. 8. Attach the body to the base with toothpicks and secure with the glue gun. Repeat for the head and hands. Glue the bow and buttons in place as shown. 9. Glue a large candy cane near each hand, and glue a few more around the edge of the base, alternating with mini candy canes. Add more loose mini candy canes inside the circle near his hands. With some crackle medium and paint, Smoothfoam can look just like holiday wood crafts – and no power tools required! This little snow family is itching to celebrate Christmas in July…so get ready for lots of holiday projects and inspiration this month. Mittens and scarves are optional! These 2×4 foam blocks inspired me to create something “outside the box.” I have seen a lot of wood crafts for the holidays, but since I don’t have power tools, Smoothfoam is a great alternative to wood 2×4’s. Smoothfoam can be more easily shaped, sanded, painted and embellished, too. 1. 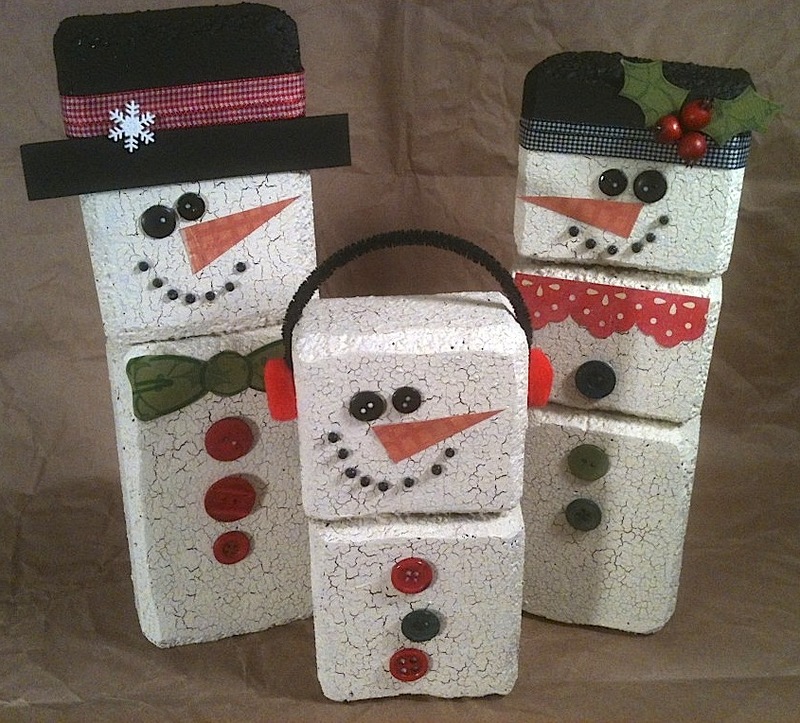 Cut the 8″ block in two pieces – 3″ and 5″ for the baby snowman. 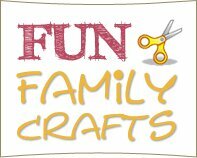 Cut one 12″ block in three pieces – 3″, 4″ and 5″ for the momma snowman. Cut the other 12″ block in two pieces – 7″ and 5″ for the daddy snowman. 2. Round off the edges off of each foam block by carving and scraping with the serrated knife over a bag to catch all the little foam bits. 3. Rub the blocks together to smooth out all of the edges – Smoothfoam acts as a sanding block against itself. 4. Paint all the blocks with Raw Umber and let dry, then brush the blocks with Weathered Wood crackling medium and set aside to dry for at least one hour. 5. Blend the Buttermilk and Bleached Sand paints together (50% each) and paint each block; let dry to create a crackled finish – the brown will peek out from underneath the white in the cracks. 6. Use toothpicks and craft glue to attach each trio of blocks together, then embellish your snowman family as shown or however you like to give them each their own personality. 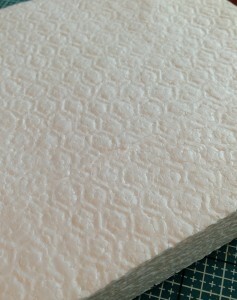 It’s quick and easy to add texture to a sheet of Smoothfoam with a rubber stamp and a hammer. 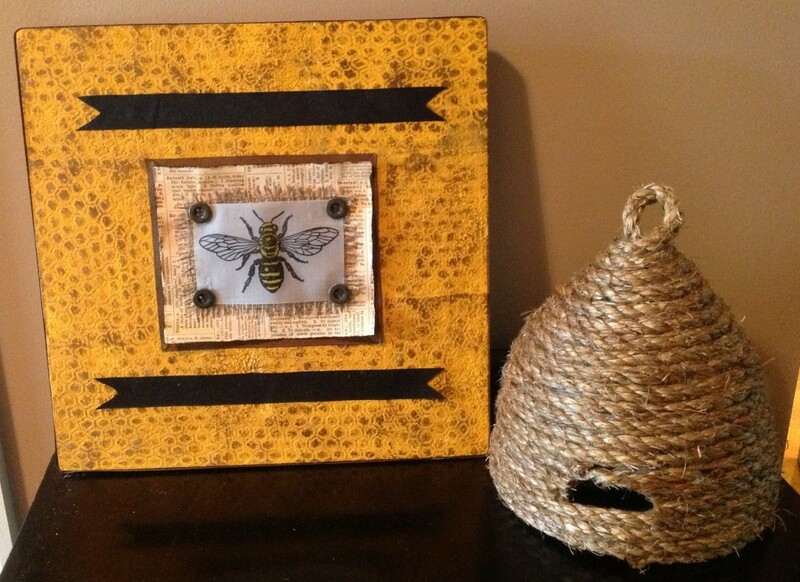 I used a large unmounted stamp with a honeycomb pattern to create the perfect background texture for my honeybee-themed mixed media wall art. I found that by using an unmounted stamp, it was easier to see where I was tiling the pattern to prevent overlap. Click the pic to zoom in and see the detail. 1. 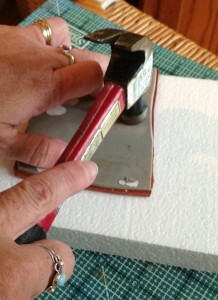 Place rubber stamp face down on the Smoothfoam sheet on a firm surface. Firmly tap the hammer all over the back of rubber stamp, pressing the texture into the foam. 2. Paint the sheet with Golden Sunset and let dry. 3. Lightly rub the ink pad over painted surface to highlight raised areas. 4. Stamp the bee image with black ink onto vellum. Color the bee as desired with brush pens, let dry, then cut the vellum to a small rectangle around the image. 5. Distress the edges of the vellum with the black ink pad, let dry, then add decorative brads to each corner. 6. Frame the bee by layering the vellum on top of burlap, then layer that on top of patterned paper and secure the layers with glue dots. 7. Glue brown ribbon strips beneath the edges of the patterned paper to finish off the frame and glue the bee to the center of the Smoothfoam sheet. 8. Dove-tail trim the ends of two lengths of black ribbon and glue each ribbon to the foundation as shown. 9. Wrap brown ribbon around the outside edges of the Smoothfoam and glue in place. This mason jar décor is a wonderfully versatile project for any time of year. Just change the contents inside the jar to match any season and display it on top of a wide pillar candle holder. I found a candle holder that came with a matching top for snuffing out a candle, which happened to fit perfectly on top of a large mason jar. I can’t believe it, but Christmas is almost here! I just got over the rush of moving into a new house and now I see stores gearing up for the holidays. This project got me into the holiday mood – I hope it does for you too! 1. Have fun blending a few different combinations of glitters and seed beads into small bowls for different colorful effects. 2. Poke a toothpick or piece of wire into a Smoothfoam ball to use as a handle, then coat it smoothly with a generous amount of Mod Podge. 3. Sprinkle the ball with one of your glitter blends until it’s fully covered. Use a small piece of parchment paper to press glitter into place and smooth out any lumps. 4. 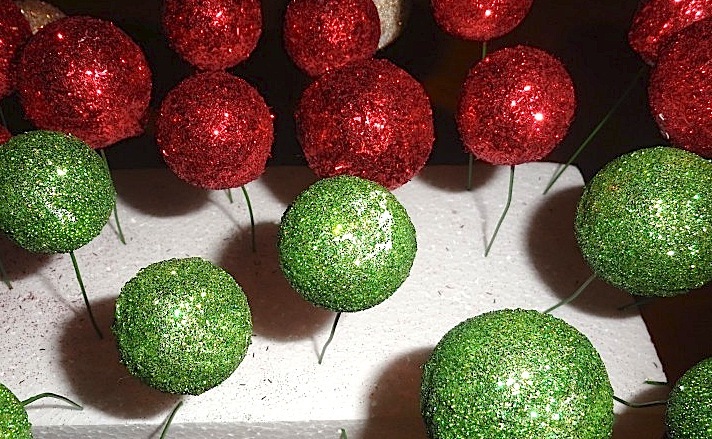 After each ball is glittered, poke it into the Smoothfoam block or sheet to allow to dry overnight. 5. 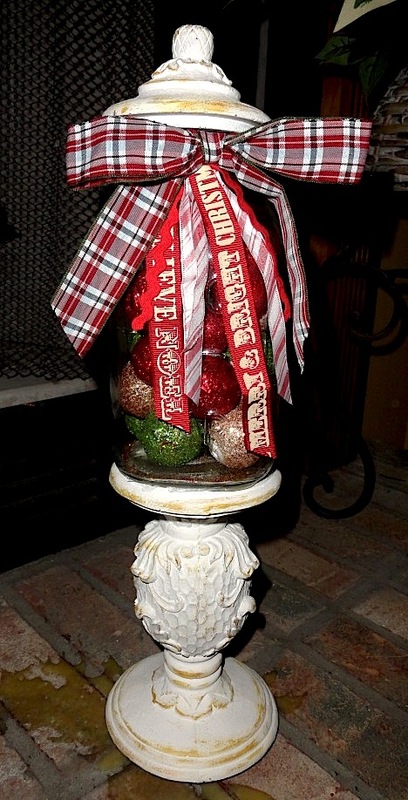 Fill your mason jar with the balls and tie ribbon bows around the jar’s neck. Glue the jar on top of the pillar candle holder to display.